The 2017 Dunwoody boys’ and girls’ lacrosse teams are making school and DeKalb County history as the first teams to qualify for the state playoffs. Coach Adrienne Rowe’s Lady Wildcats open the Class 6A-7A playoffs with a trip to Milton (14-4) on Wednesday (May 3) for a 5:30 pm game that will mark the first lacrosse playoff game in the history of the school and DeKalb County. 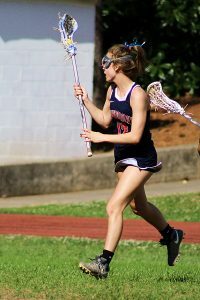 Dunwoody is 9-6 on the season having won six of its last seven games, including last week’s playoff clinching 19-2 victory over Meadowcreek to give the Lady Wildcats the No. 4 seed out of Area 7-6A-7A. The duo of Kate Snyder (7 goals, 5 assists) and Phoebe Ringers (6 goals, 3 assists) led the way to the big victory. Goalie Danielle Fiscella played a flawless first half with one save and no goals allowed. Area wins of 10-5 over Norcross and 10-8 over Martin Luther King Jr. aided the run to the playoffs during the last seven games of the season. Coach Nathan Thornton’s Wildcats have an impressive 8 wins in their last 9 games to finish the regular season at 12-5 and as the No. 3 seed out of Area 7-6A-7A. During their late season run the Wildcats picked up big area wins over Parkview (9-0), Mays (17-0) and Martin Luther King Jr. (17-4) to seal the program’s first playoff appearance. The 17-0 win over Mays clinched a playoff berth while the win over King put them into the No. 3 seed slot. Dunwoody travels to West Forsyth (15-3) for a 7:00 pm game on Thursday in the first round of the Class 6A-7A boys’ state playoffs. The Wildcats fell 20-5 to West Forsyth early in the season and look to reverse their fortunes in the playoffs. A final regular season 11-4 victory over North Springs sends the Wildcats into the state playoffs on a six-game streak. Connor Brogdon had three goals to lead Dunwoody to the victory. Adam Hydrick had seven saves and allowed just four goals in 48 minutes in goal against North Springs.